Ladybower Reservoir is the lowest reservoir of three in the Upper Derwent Valley of the Peak District the other two being Howden Reservoir and Derwent Reservoir. Ladybower is a Y shaped reservoir built between 1935 and 1943 to supplement the other two reservoirs in supplying the water needs of the East Midlands. It took another 2 years to fill and unlike Howden and Derwent dams which are built of a solid masonry Ladybower’s dam is a clay-cored earth embankment. The two viaducts needed to carry the trunk roads over the reservoir we built using a steel frame clad in concrete. The building of the reservoir resulted in the drowning of the villages of Ashopton and Derwent. Ashopton was demolished before the reservoir was filled, but much of the structure of Derwent was still visible 14 years later, during a dry summer. The River Derwent, Derbyshire’s longest river, flows south for 66 miles from Howden Moor firstly through Howden Reservoir then Derwent Reservoir and through Ladybower Reservoir then continues south into the River Trent just south of Derby. The River Ashop flows into Ladybower Reservoir from the west. When the Second World War broke out in 1939 labour and raw materials became scare so the building of the reservoir was delayed. The reservoir was formally opened on 25th September 1945 by King George VI accompanied by Queen Elizabeth. The Howden and Derwent Dams were built in the peaceful Derwent Valley between 1901 and 1916. The peace was shattered by the roar of Merlin engines powering Lancaster bombers over the dam walls as 617 Squadron (The Dam Busters) began their training runs for the attack on the Great Dams of Western Germany in World War II. Derwent Dam was chosen by the Lancaster bomber pilots for practising their low level flying and the new bouncing bomb aiming techniques because it was very similar to the Germany dams they were going to attack. Over the weeks the southbound flight path over the Derwent Valley became unchallenging for the aircrews so they used Bamford Church Tower as a turning point and returned northbound to face a much harder exit from the valley. The 617 Squadron was formed under great secrecy at RAF Scampton and their mission was given the codename Operation Chastise which was a Second World War raid on Germany’s Ruhr dams using Barnes Wallis revolutionary bouncing bomb and modified Lancaster bombers. The German dams which helped provide vital water and electrical supplies for the Nazis were targeted on the night of May 16th 1943 with two dams successfully destroyed. These spectacular reservoirs and the beautiful area around them are now popular tourist attractions with the Fairholmes Visitors Centre and picnic area with gift shop, cycle hire and public toilets located at the northern tip of Ladybower Reservoir just to the south of Derwent Reservoir and the Ladybower Information Centre with picnic area and public toilets situated on the A6013. Win Hill at 462m is nearly surrounded by water with the River Derwent to the east, the River Noe to the south and Ladybower Reservoir to the north. Win Hill is either the first or the last hill on the Derwent Watershed and Edale Horseshoe challenge walks. It is mostly ascended from Yorkshire Bridge with a steep climb by Parkin Clough or from Hope which is a much gentler ascent. Win Hill is linked to Kinder Scout via the ridge that runs northwest from the summit. The Roman road from Glossop over the Snake Pass crosses the ridge and descends to Hope and the old Roman base of Brough in the Hope Valley. Win Hill Pike locally known as the Pimple and often called Old Witches Knoll is marked by a triangular point on the top of Win Hill and is often used for a Duke of Edinburgh Award station. 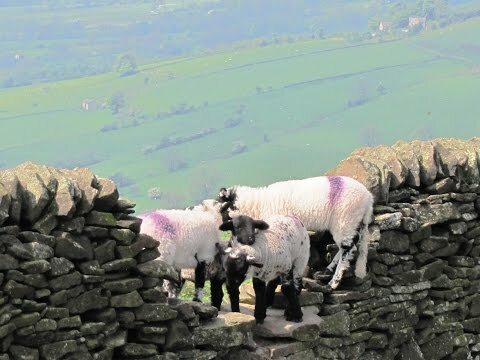 The views from the summit to the east of Ladybower Reservoir and to the west of Hope Valley, Edale Valley, Lose Hill, Mam Tor, Rushup Edge and the Kinder Scout Horseshoe are stunning. After parking at the side of the road we walk along the pavement to the head of the dam and take the path to the left between the black iron railings signposted Win Hill. We follow the little path downhill, turning left at a wooden fence in front of us, until we reach a gate. We go through the gate and turn right and follow the road to go over the bridge then turn immediate right onto the no-through road. We head forwards through a gateway then turn left signposted Win Hill. We make our way steeply uphill following Parkin Clough on our left through the trees using the steps. As we walk further up the path becomes rougher with stones and tree roots. We eventually come to a gate we go through and keep heading forwards uphill signposted Win Hill. We soon come out into the open and make our way up to the summit we can see in front of us. The views from the summit were very hazy from the warm sunshine but on a clear day we could imagine how beautiful they would be. We then keep heading forwards on the well defined track running into the distance. We start to go downhill and keep following the track to the wood in the distance on the right. At the wood there is a path that goes off to the right that leads through the wood downhill to the side of Ladybower where you can then turn right and follow the track at the side of the reservoir for a shorter walk. But we keep heading forwards following the track along the edge of the wood on our right. We come to a gate go through and walk between the wall and the wood to the next gate. We go through the gate and bear left onto the Roman road. We head forwards uphill for a short way to go through a gate and then turn right downhill signposted Hagg Farm. We go through a gate and keep heading steeply downhill bearing right to another gate. We go through the gate and follow the little path down to a track. We turn right and just keep following the track until we arrive back at the head of the dam. We turn left over the reservoir and then turn left back to our parked car. This is a moderate walk on mainly good paths and tracks although the path through the trees following Parkin Clough is a stiff climb over large stones and tree roots and also through the wood downhill to the reservoir please take care after rain or in wet weather. There are a few inclines and declines. Elevation: Approx lowest point 160.2m (525.6ft) approx highest point 462m (1515.7ft). Approx 8.3 miles allow 3½ to 4½ hours using OS Explorer Map OL1, The Peak District Dark Peak area. The shorter walk is approx 6.5 miles allow 2½ to 3 hours. Start: at the side of the road (A6013) between the bridge and dam. Ladybower Reservoir is to the west of Sheffield close to the valleys of Hope and Edale in the dark area of the Peak District. This route avoids going through Sheffield. From the M1 take junction 36 and head for Sheffield North on the A616 to Stocksbridge. After passing Stocksbridge and Underbank Reservoir on the left take the first minor road on the left onto Mortimer Road. Follow this road until you reach the A57. Turn right onto the A57 then at the junction and traffic lights turn left onto the A6013 to go over Ladybower Viaduct. The free car park spaces are on the right at the side of the road and the pay and display car park is on the left. Parking: Free parking at the side of the road in the bays and a pay and display car park with information centre. There are public toilets in the car park which also has a picnic area, refreshment kiosk and information centre. Not far away there is the visitors centre at the northern end of Ladybower Reservoir with public toilets, refreshment kiosk, picnic area and cycle hire. There are also two pubs nearby the Ladybower Inn on the A57 and the Yorkshire Bridge Inn on the A6013. The next nearest public toilets and refreshments are at Bamford approx 2 miles further down the A6013. Fab walk this and a great shame that you did not have the views that we did today only a week after snowfall. We could see all the hills you mentioned and beyond down through the White Peak area. Who would have thought it could be so sunny and quite dry. I can remember doing this on my bike years ago and getting much wetter in the deep holes on the top.